1. VELOCETTE VENOM 1960 3 OWNERS. LOW MILEAGE. KNOWN HISTORY. CLUBMAN TRIM , AVON FAIRING, REAR SETS ETC. LOVELY ORIGINAL UNRESTORED. £7500. 2. 1980 HONDA CT125 TRAIL BIKE 1100 MILES ONLY FROM NEW 1 PREVIOUS OWNER MINT AS NEW. UNIQUE UK BIKE. £2950 . 1928 'BLACK' ARIEL 500 OHV MODEL A/B. GIRDER FORK/RIGID FRAME BANBURY BIKE. ABSOLUTELY MINT CONDITION. HISTORY FROM NEW. (ORIGINAL 500cc SIDE VALVE ENGINE INCLUDED). £7900. WANTED 40/50's TRIUMPH TR5 TROPHY RIGID OR SPRUNG HUB ANY CONDITION. 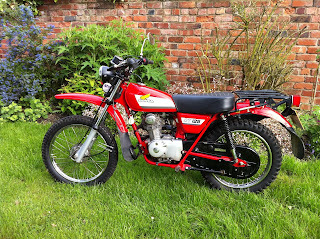 OTHER RESTORATION PROJECTS,SPARES AND BIKES FOR SALE AND WANTED.